Dinosaur State Park is one of the largest dinosaur track sites in North America. 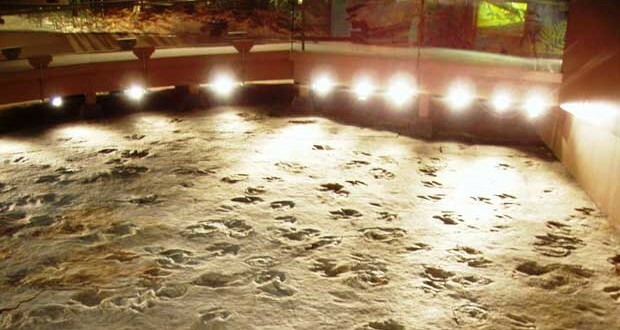 The park boasts an impressive display of early Jurassic fossil tracks underneath its geodesic dome that date back 200 million years ago. The museum houses a bird’s-eye view of the preserved Mesozoic floodplain that is covered with tracks. Dioramas of Triassic and Jurassic environments, interactive exhibits, and collections of fossils can be viewed in the museum as well. Dinosaur State Park is a day park without camping. Nearby campsites meet all camping needs after leaving the park. The park has restroom and picnic facilities to make a day trip convenient and comfortable. A friends’ bookshop, auditorium, and discovery classroom make visits to Dinosaur State Park memorable and educational. Dinosaurs State Park has walking trails that are open daily. Crafts, fossil boxes, outdoor bingo scavenger hunt, letter boxing, and films in the auditorium are great activities to please all members of the family. School Fields Trips and Scout Troops are encouraged to visit Dinosaur State Park because many activities can be catered to meet the needs of larger groups. Dinosaur tracks, life-size diorama, reconstruction of geologic formation, and interactive displays can be found inside the dome. On the grounds, a track casting area, gem and fossil mining sluice, and the arboretum of evolution are fun, educational opportunities for all.